Cybook Odyssey HD Frontlight Headed to the U.S.
One European eReader I have always had an overseas crush on is the Cybook Odyssey HD. Now that French eReader developer Bookeen has released a 2nd-gen edition of this device—with a frontlit display—I want one even more. The Cybook Odyssey HD Frontlight features a 6-inch capacitive touch HD E Ink display (1024 x 758), and its proprietary High Speed Ink System (HSIS) technology makes it one of the most unique eReaders I have ever seen. HSIS enables this device to have vertically scrolling menus (without flashing), ultra fast refresh rates, and even E Ink screen animations. For example, every time you open an eBook, an image of its cover smoothly expands across the display, just as it would if it were on a tablet. The Odyssey HD Frontlight is powered by a Cortex A8 Texas Instruments Omap 800 MHZ processor with 128 MB of RAM. Bookeen’s product listing states that this processor “stands up to the most powerful tablets”; I’m not sure about that, but from the video reviews I have seen, operations run very smoothly on this device, and the browser is more practical to use than on other eReaders. As for the display, the Odyssey HD’s front-lighting looks a lot more uniform than my Kindle Paperwhite’s, but this could vary from screen to screen. Another thing I really love about this device is that it actually has physical page turn and menu buttons, plus a microSD card slot. As far as I know, Bookeen’s eReaders have never been available in the United States, and the Odyssey HD has been waiting on FCC approval for awhile now. Supposedly, this is about to change. According to a future distributor, the Cybook Odyssey HD Frontlight has obtained FCC clearance and will be available in North America soon. If this happens, there will be one more option for front-lit eReaders here in the States, but I’m not sure how much of an impact it will make. Amazon, B&N, and Kobo have pretty much dominated the market here (goodbye Sony). Up to this point, the only people who have heard about the Odyssey are eReader enthusiasts who read blogs like this one. Unless Bookeen plans to embark on a massive North American ad campaign, we probably won’t be seeing their eReaders around town anytime soon. I’m also worried about the price; the phrase ‘imported eReader from France’ probably doesn’t translate to a $119 price tag. Would the HSIS technology be enough to entice you away from your Paperwite, Glo, or Nook? Walmart, Costco, Target and Other Retailers to Start Selling eBooks? Are Electrowetting Displays the Future of eReaders and Tablets? Not enough reader for what’s going to probably be a $150 product. This runs 119 pounds, Sterling, right now. In the states, even with a substantial discount, that’s still $150. Is that the reason I won’t get one? No. The reasons are that it isn’t terribly customizable. i can’t install the Nook or Kindle readers on this. It doesn’t support audio. It’s really not enough extra stuff to entice a US consumer. Nook GL, Paperwhite, and Kobo Glo are all much better options. Just as an observation, one cannot install Nook or Kindle apps on the other devices either. They are all basically locked into their own readers. Of course the tablet ereaders like the KF and Nook HD are a different class. That said, I doubt it will gain much traction over the market leaders here. 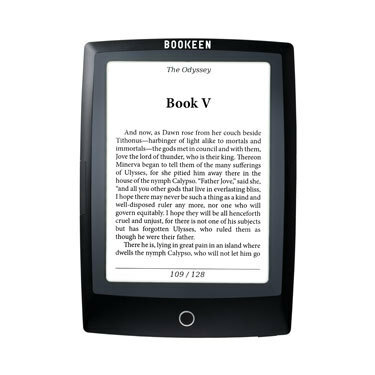 Most people are already committed to the major market ereaders. By rooting out a Nook Glowlight, you can install the Kindle, Kobo, Play Books, and other reader stores. Here is something not widely known, but the Cybook Odyssey HD is NOT locked into any specific eBook store. You can actually chose which store you want to be default on your device! That means B&N, Kobo, Smashwords, Feedbooks, or another ebook store could be linked in to your device. Good point, or you could just buy a tablet or KF and not have to root. Although, many buyers are not skilled enough to root devices or are scared about invalidating the warranty. But there is an appeal to eink screens over LCD, that is why I bought the new Paperwhite and sold my KF on ebay (which had the Nook store side loaded). I have always wanted to root a device, but I just don’t feel I have the technical expertise required. I enjoy devices that have a lot of native capabilities. I have been able to perform some simple actions with my eReaders (adding fonts, mods, ect), but I rely heavily on step by step instructions that are written for the layman. Some of the how-to guides I find on Mobileread might as well be written in a foreign language. I have sideloaded a firmware update and two patches on my Onyx Boox M92, so that made me feel accomplished, but there is a file manager for it that I hesitate to install because making mods to the firmware requires altering code/file names. It doesn’t help that I am a Mac user and most rooting instructions are for Windows/Linux users (the only time running iOS has been a negative for me, lol). Every once and awhile, I check eBay for a cheap used Nook Simple Touch. Eventually I will buy one on the cheap and just go to town on it. Looking at online reviews, it seems that the Odyssey HD doesn’t support DRM encoded Kindle books or Nook books… in other words, any of the books you can download from them. With or without the ability to browse to the B&N or Amazon web sites, the only way to read these on the Odyssey is the same way as it is with any other reader… download, remove DRM, convert (as needed). Without the ability to install a dedicated Nook or Kindle app, there’s no way to use the device to read non-converted books. And since it’s a Linux machine, no Kindle or Nook apps exist. If this was built on the Android infrastructure, rooting the device would allow installation of pretty much any reading app. As it is, though, rooted or not, Linux just doesn’t do that, since the apps don’t exist. Sure, you can use the web-based cloud viewers with Linux, but that experience is sorely lacking. Again, nice device, but no real compelling reason to choose it over any other e-ink reader. I’ll keep using my rooted Nook GL with the built in Nook reader, the Kindle Amazon app, Google Play Books, Kobo, Aldiko, and whatnot. No conversions are necessary. Yeah, on my rooted Sony Reader I have access to most major eBook ecosystems through their respective apps. I guess Kobo Books could work on here since I’m guessing it supports Adobe DRM like most eReaders do, Kobo has the biggest discount codes. Regardless, this does have extremely impressive specs, with a similar processor, resolution, and RAM of an early iPad, in an eBook package. Once it is available in the US you might wish it wasn’t. It depends if they have replaced that ridiculous capacitive layer from the last iteration that wrecked the contrast and everything else. I thought capacitive layers were not appropriate with e-ink screens until Amazon did it properly. Also, Bookean doesn’t have a good reputation for quality either: software issues, hardware issues (mini USB port not mounted to PCB etc). When mine was delivered it had already found its way out of the packaging and was rattling around inside. I returned it after I saw the screen. However, I like the curves on the Bookean. An ereader does not have to be the same shape as a book surely? Does anyone know about these light layers, are they all developed by each ereader company or by someone else? The specs seem to match the original iPad’s specs (resolution, iPad A4 was based on the Cortex A8, same RAM) and this is on an eReader that doesn’t need to drive all those extra processes. The speed and screen should be fairly impressive to say the least. Yeah I have been trying to find a tablet with this exact processor and RAM on it, but I haven’t been able to. For example, the Nook Color used a variant of the Cortex A8, but it has a different extension/serial number, so I’m not sure if this is the same one used in the Odyssey. I have been wishing for an eReader with the same processor as, say, the Kindle Fire HD for a long time now. If the Odyssey does indeed have a tablet scale chip under the hood, I would be very impressed. First gen iPad was with 256 Mb RAM not 128 Mb. Thanks for clearing that up Bormasina. I was pretty sure that the Odyssey doesn’t have the same chip as the original iPad.